Welcome news from Raymond Young at RJC Yachts as he closes on the sale of the 25.9m motor yacht Surya, listed for sale by Michael Mahan at Worth Avenue Yachts. Surya was built by Pacific Mariner in 2005 with hull design by William Garden and exterior styling by Gregory Marshall. A warm interior by designers Gonz & Alma features satin cherry wood joinery and neutral colours throughout. A large saloon with comfortable seating has a 50-inch home theatre-style television and a separate formal dining area. A popular charter yacht, Surya sleeps up to nine guests in four staterooms. A full beam master suite amidships features an en suite bathroom with oversized Jacuzzi tub and shower, while two double staterooms come with queen-size beds and en suite facilities. There is also a twin cabin with an en suite bath, and all staterooms come with individual entertainment systems. Twin 1,480hp MTU engines power her to a cruising speed of 22 knots and maximum speed of 28 knots. 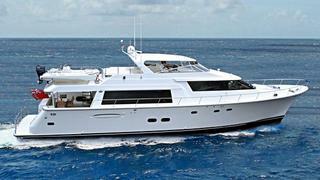 Surya was asking $2.7 million and will be renamed Reflections.